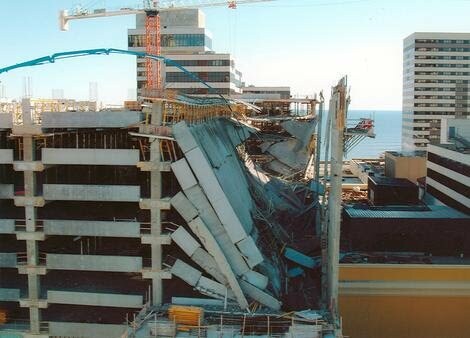 On October 30, 2003, several floors collapsed of a parking structure that was under construction at the Tropicana Casino and Resort in Atlantic City, New Jersey. As part of the investigation of the collapse, large non-linear finite element analyses were conducted by Construction Technologies Laboratory (CTL) using the software package DIANA. At the request of a law firm representing one of the defendants, I and Prof. Kuchma completed an independent review of the results of the DIANA analyses. We also conducted additional analyses using other analysis programs. This investigation involved the review of existing reports on the collapse, testimonies, and laboratory test results to assess if the completed analyses could capture the distribution of forces in the region of the collapse and the expected mode of failure. More information of the collapse of the parking structure is provided here.